Tickets for the seating area at the Petrillo Music Shell will go on sale Friday, April 29, at 10 a.m. at the Taste website, tasteofchicago.us. The concert will begin at 4:30 p.m. General seating tickets are $23 and premium seating tickets are $50. Taste of Chicago is presented by the Department of Cultural Affairs and Special Events and sponsored in part by Bud Light, Chicago Tribune, Chicago Transit Authority, Communications Direct, CLTV-Chicagoland’s Television, Eli’s Cheesecake Company, Humana, Illinois Lottery, Lifeway Foods, Pepsi, Shoreline Sightseeing, Southwest Airlines, V103, WGN-TV, WGCI, 101WKQX and 93XRT. 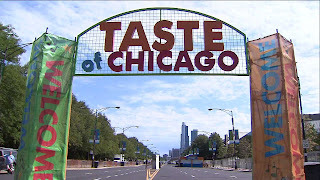 The 36th Annual Taste of Chicago is July 6–10 in Grant Park with hours 11 a.m.–9 p.m., Wednesday–Friday, and 10 a.m.–9 p.m., Saturday and Sunday. For more information on the FREE admission festival, call 312.744.3316 or visit tasteofchicago.us. To plan your trip to Chicago, visit choosechicago.com. Join the conversation on Facebook at Taste of Chicago and follow us on Twitter, @TasteofChi (#TasteofChi) or TasteofChicago.us.